When I started this blog, I stated my goal of posting weekly. Apparently that hasn’t been happening, and it seems that a post around every 2-3 weeks is more realistic. It’s not due to laziness, but moreso the time it takes to answer the question ‘what do I write about this time?’ I’m only a second year student who admittedly only knows so much about planning to support enough content to write a full and worthwhile post, so I take this question very seriously! However, the answer finally hit me in the face on Christmas eve: write about the role of public art in communities. The way I think about and perceive communities today was initiated by a walk in my grade 10 art class, where a public art activist brought our class downtown to see where public art could make the downtown space more friendly. I specifically remember standing on the Century Place concrete thinking what landscaping could be done to remove the gray that permiated through the downtown. Below you can see just how bland the space is with a lack of a particular focal point or even seating which could encourage people to stay and converse. With that said, you can begin to understand the role public art plays in cities and their communities, neighbourhoods, and downtowns. Self expression is a natural response to experiences that we have in our every day lives, and is what drives humans to manifest their self expressions into what we deem ‘art.’ It can be asked, then, that if art is created from personal experiences, then how is public art created and expressed? Public art attempts to capture the attention and, consequentially, the emotions from passersby at a general level. There is something for everyone within a public art piece, whether that be the colour, the shape, the size, the texture, the positioning, or their interpretation of the piece. With all of these interpretations and opinions of the piece invisibly floating around a community, the passersby are engaged in the space even when they don’t fully realize it. This engagement (if the public art was a success) attracts people to the space again and again, which is good for a downtown, for example, where people would revisit and the local economy would consequentially grow. Successful art peices promote conversation between friends — and, with an even greater deal of success, strangers — which makes the space a more interesting place to be. It is okay to question why public art is so important to spaces. At face-value, it can seem like a question that can only be faced with circular reasoning: ‘public art makes places interesting, okay, but why is that important?’ ‘Well, you know, because it makes places interesting!‘ We initially resort to this quick answer because it is natural for us to want to be in a place that isn’t boring. Boring places make us unenthused, make us want to be elsewhere, and actively change our emotions while being in that boring space. We as people constantly want something to entertain ourselves with, whether that leaves us looking at news feeds on our tiny handhelds or stopping to look in storewindows or people-watching. We live off of our opinions of things, events, and people, and our short attention span reflects that. You may notice that when you are in a boring place (vaguely self-defined as containing what you personally perceive as ‘boring’) you may be annoyed, agitated, or just plain bummed out. This can be compared to an exciting and interesting place with conversation-pieces and entertaining events in which you might notice you are happy, engaged, and interested. Public art is important to spaces because of its effect on that space and on the people who visit that space. This, in turn, makes the space more vibrant, which could very well have a positive effect on the space’s performance economically, socially and environmentally. Ahh, yes, a drab concrete slab right at the major intersection of Belleville’s downtown core. This area is actually a major hub for pedestrians and drivers, either passing through, working, or spending leisure time within the downtown core. Perhaps you have walked through here and noticed how empty this space is – or perhaps you haven’t even really thought about it at all. It really is an empty canvas just waiting for something – anything – even planters to bring a little life to the space. Having been there myself, I can tell you the only thing for people to sit on in this space is one small and lonely concrete bench which is often taken up by a smoker not many people want to sit beside. As someone who has a huge passion for downtown Belleville’s history, I almost take offense to the lack of public art here. Public art can and often does take on a civil service of historic commemoration, and I touched upon this in my last post. Belleville’s downtown has an intricate and interesting history and in the most traffic-heavy space in the downtown core there isn’t even anything that offers passersby a connection to it. Take a look at some of the many projects that cities and communities around the world are doing to enhance public spaces for the passersby there, in hopes of making the space more engaging, interesting, and vibrant and, in turn, lifting passersbys spirits if even just a little bit. Public art is more than just creating an engaging space for people and encouraging them to look, listen, converse, stay a while, then come back later. Public art offers a sense of identity to cities, communities, and most importantly their people: shoppers, residents, workers; all classes, all ages, all races and speakers of all languages. What is more cool than a free art show in your community? Consider what public art there is to experience in your community, and how it makes you feel. If your city spaces are boring, what can be done to create interest in that space? Maybe you’re not an artist, but you are the one who’s looking at and experiencing the art when it is installed — what do you want to see and experience in your public spaces? When I was around 12 years old, I found pictures of what certain stretches of Bridge Street East looked like in 1953 on Google Earth (the image above is not one of them). Since then, I’ve loved wrapping myself in research of Belleville’s history. It’s gotten to a point where, as I walk around the city, I can recall architectural histories of specific houses right off the bat, and I can tell you what businesses used to be in what buildings in the downtown core. Aided by old city directories, insurance maps, and pictures, I find it so addicting to learn what the city and streets used to look like; I love being able to appreciate how my city grew and developed. When people think of city planning, it’s common to think of it in terms of the future. This makes sense – the word ‘planning’ naturally refers to the future. However, planning is so diverse, and it encompasses something I would love to take part in during or after my studies at UWaterloo – heritage planning. It kind of sounds like an oxymoron, but heritage planning focuses on the preservation and protection of cultural heritage so that historic aspects of the city can be appreciated as the city grows and changes again over time. It is because of heritage planning that you can appreciate century-old architectural gems in your city, museums, and commemorative statues that reflect your city’s historic accomplishments. Historic preservation aims to preserve and celebrate the city’s (or town’s, or neighbourhood’s, etc.) identity. It’s rather difficult to justify why heritage planning is so cool as someone who has a natural passion for city history, but I will try. As cities grow and expand, it’s important to reflect on what had influenced the growth of a city in the first place. It’s a form of respect that the city and its culture deserve. Without a sense of history, the city risks losing a sense of identity. Think of a city with no roots to ground it; a city that becomes a whole new entity with every change of plans. A city like this can not physically exist – it is natural for cities to have a story detailing its growth and it is the responsibility of planners to manage and celebrate meaningful parts of this story through appropriate and respectful design and policy decisions. A city without a sense of identity is a desolate place; such an empty identity would result in a lack of connections between the city and its people. That being said, what does it mean to me to be a Bellevillian? Should this have any significance anyway? I connect growing up in Belleville in the early 2000s to how I could have grown up in the early 1850s, 1900s, and so on; considering all of the beautiful ‘vintage’ photos I have looked at and town plans I’ve read, I think that Belleville has so much interesting history to learn and I’m happy I’ve become a part of it as a Bellevillian. Additionally, I argue that your demonym does have significance. Where you grew up/where you live has a huge influence on your growth as an individual. Of course, to be a Torontonian, for example, is not the only aspect of one’s self. However, to be a Torontonian would mean you grew up in a very multicultural, dense, and evergrowing city; it would be silly to suggest that this has not had any effect whatsoever on how you grew as an individual and what kind of person you’ve become with whatever interests and whatever concerns. Your city reflects you, and you reflect your city. Currently, I am in the process of learning what it means to be a resident of the City of Waterloo. I am definitely more connected with Belleville’s history (and, as a result, what sense of identity it offers) than Kitchener-Waterloo’s, but I still ponder the histories of the streets that take me to and from campus, the grocery store, and the bar (which is, to be honest, the extent of my travels here as a student). Currently, I consider myself more as a student than a citizen here, but I can’t ignore the fact that I live here and spend my money here. Still, my Waterluvian identity is carefully unfolding. Now it’s time for you to consider what significance your demonym has. What role does your city’s history play in the significance of that demonym? If you don’t even know anything about how your city came to be, I encourage you to take a look. It doesn’t take a trip to your city hall to learn more about your city’s history; you can easily find Facebook pages or blogs that post vintage photos of your city’s neighbourhoods that are, at face value, just plain cool to look at. You may not find it as addictive as I do, but you’ve been warned anyway. Below are some links to get you interested in (or at least acquainted with) Belleville’s interesting and glowing history. One of my favourite planning anecdotes is that the inventor of the modern shopping mall ended up despising his invention. In the wake of the suburban boom, Victor Gruen saw a need for a safe and engaging place that was not one’s work or home, where participation and interaction could thrive. The mall was a hub for culture, entertainment, and commerce. It was an exciting and lively idea, especially post-war. As malls began to pop up all over the country, Gruen grew to hate what his invention had manifested into. Shopping malls have resulted in disconnected cities and have contributed to suburban sprawl; a detriment to social activity and to the environment. Think about your city, especially if it is a smaller city of less than 100 000. If you have a mall, where is it located? It is probably located near your highway. Why is that? What do you think it’s doing to your city? Compare your mall to your city’s downtown. Can you name ten businesses located in your downtown? You can very likely name ten businesses located in your mall. If you were driving down the highway and got off an exit to a city, you would very easily find its mall. You might shop, and maybe you would get some food, and you would want to be on your way. There is no purpose for you to continue into the city, you have done what you needed to do at the mall, and the highway is so conveniently placed that you feel welcome to leave. Hidden in the shadow of the city’s mall is its downtown, forgotten especially by tourists and often only supported by inner-city dwellers. The disconnect that the mall has created between itself and its city has negatively impacted local economies, small businesses, and has picked at the social activity of a city over the decades of the mall’s existence. Without a primary focus on the city’s heart and core, the city slowly dies! Its life is found in the outer suburbs that thrive off of the malls and vice versa. So what do we do about this disconnect and deterioration? Downtown revitalization has been the answer to this issue to cities across North America, and for good reason. So many cities have been able to start the process of reversing the negative effects of the mall’s existence through downtown revitalization. What is downtown revitalization? Well, what isn’t it? When you think of those words, you may think of loud construction, but it isn’t always so disruptive. A primary non-physical aspect of downtown revitalization involves better marketing strategies – for example, consider London’s Get Down! campaign that took advantage of this age’s social media boom and put their downtown in the spotlight. Marketing strategies such as this are often only part of a much more involved strategy that aims at re-energizing downtowns. Cities invest millions in their downtown cores. Belleville has just completed Phase 2 of its downtown revitalization process, having polished off a major commercial section of the main downtown street, Front Street. As a part of the Belleville Downtown Improvement Area during the summer, I was in the front seat for the bulk of it. After a major facelift for Belleville’s downtown, it is a much more welcoming place to be. 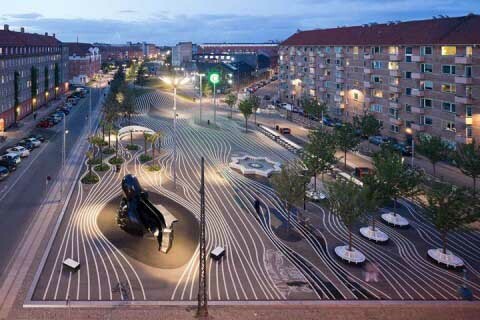 Aesthetics play a major part in city planning, as it’s so primary to one’s perception. With newer and more welcoming city infrastructure, more people and activities are accommodated. Downtown revitalization is also an excellent tool for keeping cities up to date and with the times. For example, more people are turning to bikes than cars – especially millennials – and Belleville’s new Front Street is now a safer place for cyclists. If cities spend millions on their downtown centres, what comes out of it? The refocus on downtowns stresses the importance of the local economy and of communities that are socially active and invested. In many cities, downtown revitalization takes on a new urbanist form where living accommodations are mixed with cultural hubs and local stores. This puts an emphasis on walkable neighbourhoods and encourages social activity and welcoming environments. But why is downtown revitalization relevant? Are cities better with these new urbanist motifs unfolding in their downtowns? What difference does it make? This brings us back to the shopping mall. First consider a social, walkable, accessible downtown with a mix of transportation – cyclists, pedestrians, cars, public transit – with business owners and residents who naturally encourage and support each other as part of a community. Compare this to a hollow shopping mall placed near a busy highway and surrounded by a sea of pavement and cars, cradling big name stores that do not rely on excellent customer service to keep their business running. This mall is completely disconnected from the outside world. What is a more interesting and engaging environment between these two options? Downtown revitalization is happening to compete with the convenience of malls and to bring people back to not just the city, but to the heart of the city. Interestingly enough, malls are becoming more desolate as online shopping becomes a bigger and even more convenient trend for people all across the world. North American malls are beginning their decline, and there are more and more malls – especially in the United States – that are becoming hollow holes of what once was a booming feature in the suburban glory of the 50s going forward. So while downtown revitalization is currently competing with what energy malls are left exerting, it is also beginning a huge competition with the new age of purchasing something from the comfort of your bed and having it arrive at your house in less than 48 hours. Is it realistic for downtowns to compete with this advancement of technology? What will cities become as we turn to online interfaces for almost every social interaction? Will downtowns – or even cities – become obsolete the further into the future we go? Or will there always be insurmountable value in seeing a friendly face as we open a local store’s door? You can look back at past experiences to consider how attached you are to your city and to your city’s downtown. You can also anticipate your involvement in your city as technologically evolves around it. I think I will always appreciate downtowns as a social hub of interaction and interest, and being able to interact with a friendly face in indoor and outdoor settings. Downtown revitalization is a process that cities must take to remain competitive in today’s technological atmosphere, but it’s up to how the public reacts that would ultimately determine whether or not the revitalization was worth the investment. So ask yourself, do you appreciate malls, computer screens, or downtowns as your go-to avenue of social interaction? What are the social consequences of your choice? How does this choice affect your city? I am not exactly sure how to introduce this blog, because I am not exactly sure of what this blog will become. My intentions lie in discussing cities, but as an undergraduate studying urban and regional planning who has not declared any specific interests in certain avenues of the planning world, there are no limitations as to specific topics that this blog will focus on. As of right now, I find I am interested in local history and social planning — how people interact with their environment and how their environment influences their daily decisions. However I could and likely will also comment on urban design, land use, and city politics; this blog is a way of exploring what I am interested in within and surrounding cities. Understanding what perspective I am coming from would be important in assessing why my point of view is my point of view, because everyone experiences a city differently. My name is Katie Turriff, and I am currently in my second year at the University of Waterloo studying Urban and Regional planning. Though I spend my time and money in Kitchener-Waterloo, I consider my home base to be in Belleville, just a five hour drive Eastbound, where I was born and grew up. Belleville is a city the size of approximately 49 000 people; about 1/10th the size of the metro here (Kitchener-Waterloo-Cambridge). The demographics are very different here, too: Waterloo is so much more diverse and, of course with two university and some-odd colleges, there is a huge presence of students here than in Belleville, which boasts only Loyalist College. Belleville is much more of a baby-boomer town — so you can imagine how much more I fit in here than there. Because of my Bellevillian roots, anticipate reading about a lot of comparisons between Belleville and Southwestern Ontario, along with commentaries on planning articles and on what is going on in cities around me and around the world. I will try to update this blog weekly at the very least.